Thank you to everyone who included me in an etsy treasury. During December I was featured in eight different listings. 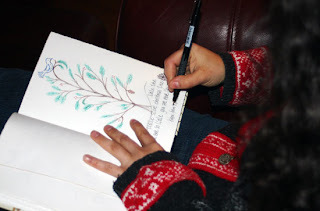 I am always delighted to see how much creativity goes into putting a treasury together. I included a few here for you to peruse and a full list of all eight treasures is below. how fun is ... Where's the Fire? Wishing everyone a joyous holiday season and a very merry Christmas! The San Antonio Glass Art Guild (SAGAG) recently had their holiday gathering. 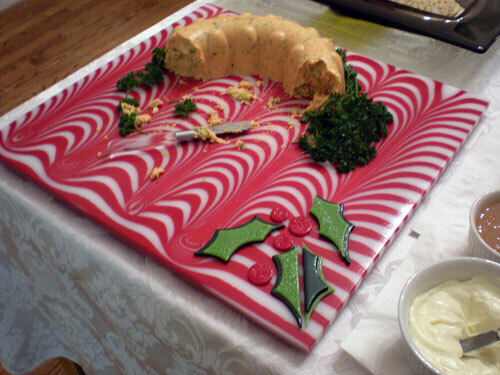 Jeanne served her fabulous shrimp mouse on an amazing handmade holiday tray. Jeanne is a great example of the amazing talent of our SAGAG members. I wanted to take a picture of the perfect shrimp mouse, garnished and displayed on such a lovely try. It was such a hit that in the few moments it took for me to grab my camera it was just about gone. On the bright side it cleared the way for us to get a better look at this lovely combing. Proceeds from the cookbook go to the guild's scholarship fund to support members seeking to attend conferences, workshops and other educational opportunities. I am scheduled to teach the following workshops at Wired Designs Studio. You can sign up for glass by contacting Wired Designs directly at 210/4954495. 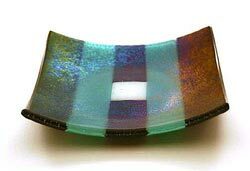 A one day workshops where students are introduced to the essential knowledge required to work with fused glass including compatibility, firing schedules, cold work and other important topics. Students will create two class projects during which they will be exposed to; three firing schedules (full, tack and fire polish); the use of kilns, grinders, saws; and work with a variety of glass and glass related products. This is a great opportunity to learn something new. 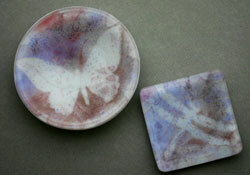 This workshop will open your eyes to the possibilities of sandblasting before and after firing. Students will work with iridized glass to create patterns and shadows using positive and negative space. 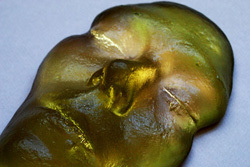 These techniques can be applied to base glass or per-made blanks before or after slumping. Glass jewelry makers can also benefit by adding new ideas and depth to their designs. Students will create tiles or wall hangings in this is a one day workshop. Learn to create imagery, depth, and drama in your work by incorporating exciting powder techniques. 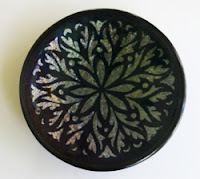 Students will create powder wafers, explore crackled powder techniques, uses positive and negative space to create custom designs and incorporate imagery into their fused glass projects. This specialty class will show you the true power of powders! Drop your chisel and learn how to achieve a sculpted look with this assistance of your kiln. 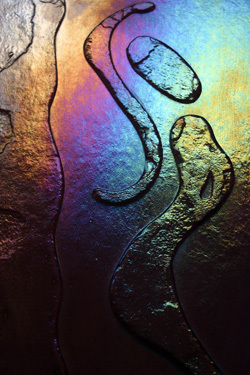 We will design and create bas relief images and textures using fiber paper to form impressions in glass. This is a wonderful technique to add dimension and pattern with economy of both labor and materials. Use the smooth clean surface on top and look through to the pattern within the glass. Or turn it over and not only see but feel the shapes and textures. Sculpt in clay; learn about mold making materials and techniques to create refractory molds; and how to measure, cut and cast glass billet for your specific mold. We will discuss the special considerations that go into a casting firing schedule, including how to heat, cool and anneal thick and uneven thicknesses of glass. 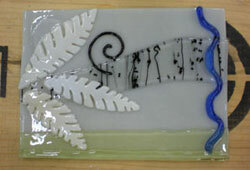 Students will cast their own work in glass. 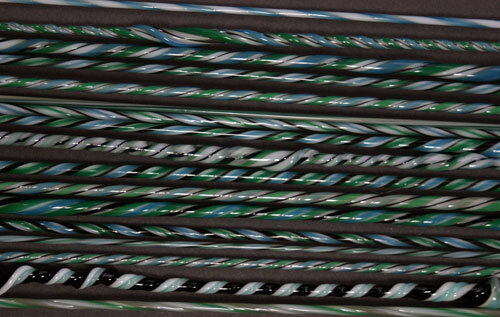 Twisted cane and latachino ranging from 6-24" in length. Last night I had the opportunity to sit for just a couple of hours at the torch over at Dream Fire Studio. 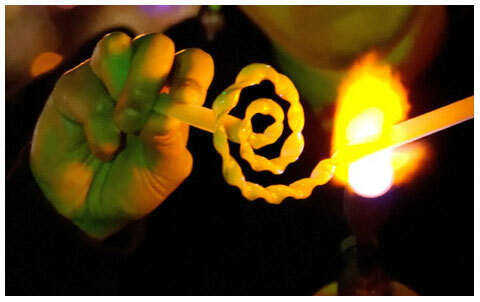 Torch work can be very relaxing and even meditative. For that window in time you concentrate on just what is in front of you forgetting the other actives of the day. This was just what I needed. With no specific plan in mind I selected a color pallet of emerald green, Egyptian blue, and black. Laying the colors over a white center I pulled a handful of latachino and a few twisted canes. These seem to be begging to be used a piece of stringer fabric or a glass weave. I'll just have to come up with some special use for them.